Tiergarten is the biggest park in the city of Berlin in Germany, and also a large area with forests, pastures, natural lakes right next to the city center of Berlin. Tiergarten in German means "big zoo", the name of this place noted that this place used to be the hunting grounds of the imperial Prussia. Nowadays wild animals are no longer living in the forests of the park, but the 200-hectare garden and grasslands are nice perspective still save natural marks. Tiergarten has an extremely large area that people using it as a name for a suburban area at the central of Berlin. 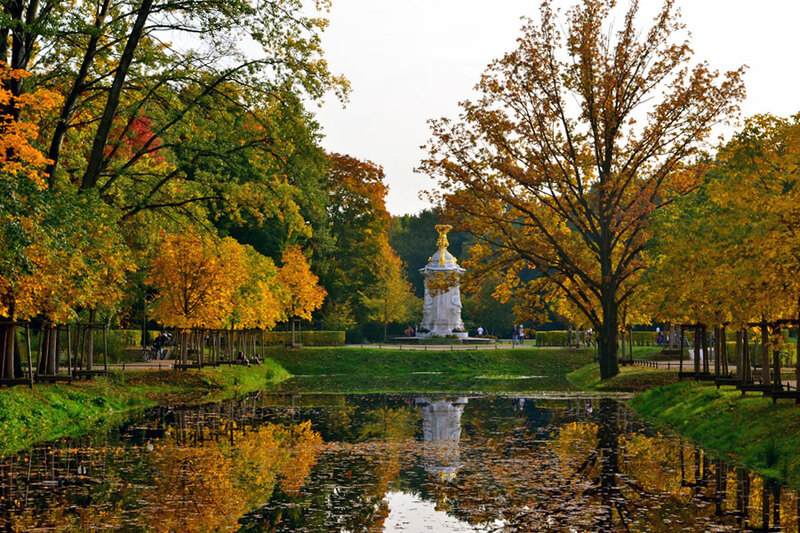 If you have the opportunity to buy a plane ticket to visit Berlin, then remembered Tiergarten. The endless trail with full of shaded is ideal for trips by bicycle or walking, or even by Velotaxi. Whenever travel here, you should take the time to explore the monuments and statues scattered throughout the park. If you are a history lover, then surely you will be impressed with the memorial to Soviet War, architectural marble column was built in 1945 to commemorate the Soviet soldiers who died in the battle of Berlin. Meanwhile, the statue of the famous composer Richard Wagner German name will be a place that should not to be missed for those who love music. In the center of the park is the victory column towering 70 meters. This column was originally built in front of Reichstag building in the 19th century, and it was relocated to its present location under the direction of Hitler and thank to that it was not destroyed during World War II. Follow 285 stairs to the top observation deck and panoramic view of Berlin. From here look toward the north you will see Bellevue palace, look to the south to see the consular area and the zoo, locate at the east from here is Brandenburg Gate and Schloss Charlottenburg (Charlottenburg Castle) is at the west. Once the weather become warmer, many families and groups often held picnics under the trees, while many others sunbathing and relaxing under the warm sun. In winter, the park also offers quieter atmosphere but retains a separate beauty. Occasionally, visitors can skate on the small frozen lake, but remember to check the thickness of the ice carefully. "Am Neuen See" coffee shop at the center of the park is the ideal place to enjoy a delicious cup of coffee with cake or you can go to the beer garden to enjoy the famous German beers. Tiergarten park is just a few minutes away walking from central Berlin there are many train stations like S-Bahn, U-Bahn scattered around, the nearest is Berlin-Tiergarten station lies near the western entrance of the park.